Figure 2.2 summarizes the two-way, chicken-and-egg relationship between transportation and land use or urban form.3 The challenge to urban planners and decision-makers is, first, to understand this interaction, and, second, to use that understanding to guide the evolution of the urban region in ways that meet societal goals as much as possible. contributes to rather than compromises other societal goals such as economic growth or quality of life. 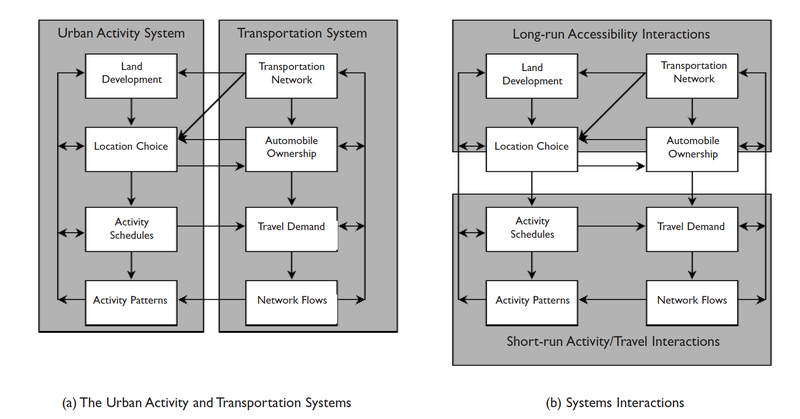 Not shown in Figure 2.2, but central to the entire urban transportation debate, are the relative roles played the various modes of transportation available within the transportation system, where a mode is defined by a specific combination of technology, infrastructure, and service characteristics. In particular, the private automobile (and the associated road system which provides the right of way for automobile use), public transit (in all its manifestations, including bus, rail and commuter rail "sub-modes"), and non-motorized (walk and bicycle) modes all play essential roles in serving the demand for personal travel in urban areas. Of these, the private automobile is the dominant mode of travel in North America. In the Central Ontario Zone, for example, for 81% of the individual trips made during a typical weekday in 2001, the individual either drove or rode as a passenger in an automobile. 3. Figure 2.2 may appear to focus on person travel, and this is true to the extent that auto ownership is explicitly included in the flowchart. With this exception, however, the figure holds equally well for businesses and the flows of good and services, and is intended to be interpreted in this extended manner.